As a growing rank of industrial property specialists especially in the eastern half of the country are discovering, a tight-knit team of Boston-based real estate veterans is aiming to prove it can squeeze superior returns out of investments in single-tenant, Class B industrial properties in secondary and tertiary markets. That approach contrasts sharply with the battles over Class A commercial mega-complexes in top-tier metros. Indeed the management team at fast-growing STAG Industrial Inc. REIT is betting that over time, investors targeting this property profile will ultimately be "overpaid" for taking on risks associated with these assets and locations. And they're betting a lot, having completed a pair of follow-on share offerings grossing nearly $240 million this year to help fund the REIT's prodigious acquisitions pipeline. From July through October alone, STAG spent roughly that amount purchasing 45 more properties, factoring to a bit over $5 million apiece, a bit under $31.50 a foot - and more importantly a 9-plus cap rate. By comparison, other well-heeled buyers targeting newer properties leased to credit tenants in top-tier markets are more likely to see caps in the 5s and 6s - and without great prospects for rent growth, CEO and board chairman Ben Butcher related in a conversation with MarketBeat. "We don't want to be in that game," the veteran real estate investment and finance pro emphasizes. STAG, which stands for Single Tenant Acquisitions Group, instead aims for diversification of its second- and third-tier markets, all manner of industries, and staggered lease expirations - and the corresponding superior returns. Still a relatively small public company at an overall market capitalization below $800 million, STAG is quickly demonstrating it can be the kind of consolidator Wall Street expects of REITs. STAG's portfolio has grown quickly to 166 properties totaling nearly 28 million feet in 30-plus states, and it may well end up investing $400 million on acquisitions during 2012 - two-and-a-half times what it was projecting a year ago. Butcher expects that over the longer term STAG's average per-property purchase price probably ends up in the $6 million to $8 million range - with acquired portfolios frequently including far larger and smaller buildings. Combined with the emphasis on mid-sized markets and down-and-dirty industrial properties, it's a target asset profile for which STAG just doesn't encounter a lot of competition from "organized capital," as Butcher puts it. In setting its targets, the STAG brain trust isn't just calling on its considerable combined experience - much of it collectively leading private predecessor STAG Capital Partners before taking the operation public through the April 2011 initial public offering. Butcher and longtime colleagues Steve Mecke, Greg Sullivan, Dave King and Kathryn Arnone also commissioned supporting research from CBRE Econometric Advisors. Hence they're able to cite hard evidence backing their bullishness on smaller markets - and in many cases small-cap properties. One such conclusion is that over time, smaller markets tend to produce stronger economic rent growth, as well as somewhat more stable occupancies and effective rental rates, compared to larger markets that experience more speculative development activity during recovery cycles. More particularly CBRE-EA's comparison of the nation's 29 largest industrial markets to the 29 next-largest over the 1990-2010 period revealed that annual economic rent growth averaged 1.13 percent in the secondary markets - a good 50 basis points better than the average in primary markets. And a statistical analysis indicated economic rent growth was also 17 percent less volatile in secondary markets. 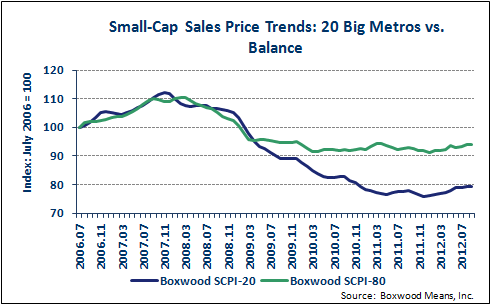 MarketBeat publisher Boxwood Means' own proprietary research likewise demonstrates that small-cap property values have remained far more stable in secondary markets compared to major metros over the recent cycle. Through September small-cap CRE prices were still down by an average of nearly 30 percent from the pre-recession peak in 20 of the largest markets - compared to less than 15 percent for the 80 next-largest. Logically investors can expect a risk premium associated with acquisitions in secondary markets - and also with Class B properties relative to Class A. While the latter differential isn't huge, CBRE, tapping sales data from Real Capital Analytics, did discover that the average cap rate on warehouse/distribution property trades in the 29 smaller markets since 2003 came in about 30 basis points higher than in the 29 top-tier markets. 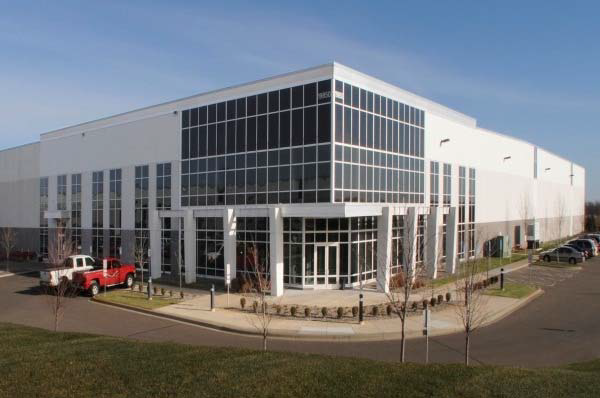 Another key component of STAG's strategy is that net-leased industrial properties require minimal operating cost expenditures by property owners, and also tend to generate more stable rents and occupancies than multi-tenant buildings. Indeed not only are warehouses and manufacturing buildings generally less costly to maintain than other property categories, the net-lease structures typically seen with single-tenant industrial buildings mean tenants manage the assets attentively. "And they do it for free," CFO Sullivan observed during STAG's latest conference call. An important related benefit is that STAG can continue its rapid geographic expansion into new markets without the levels of incremental infrastructure investments - "feet on the ground" included - that would be required with multi-tenant operations, Sullivan continued. Another attractive feature of industrial properties is that their lower rents relative to other property categories mean tenants are less inclined to move when leases expire simply to get a better deal elsewhere - helping maintain comparably stable occupancies and in turn revenue streams. And when they do opt to vacate, tenant-improvement expenditures are typically a fraction of those seen with office and retail properties, Sullivan explained. In fact during the third quarter, STAG's renewal leasing and recurring capital expenditures equated to just 1 percent of the REIT's cash net operating income. "That is simply a feature of our investment focus on single-tenant industrial," the CFO stressed. STAG stock has held pretty close to $18 since closing at an all-time-high of $18.85 Nov. 30 as its listing on the influential MSCI US REIT Index was about to become effective. And it doesn't hurt that its portfolio occupancy is comfortably beyond 96 percent, meaning STAG boasts a vacancy factor one-half or even one-third the nationwide industrial availability rate - depending on who's measuring. Life as a public company also means the debt that management chooses to tap comes at exceptionally attractive pricing. Indeed given the spread between the 9 caps on acquisitions and the 2.4 percent fixed all-in rate of STAG's new unsecured term loan, opportunities for exceptional leveraged returns appear to abound. Butcher is also quick to point out yet another attractive feature of public life that's probably meaningful to quite a few MarketBeat readers: STAG often acquires smallish portfolios from family enterprises attracted to the estate-planning benefits of exchanging equity for OP units or related securities, rather than cash.